At Skate World in Leesburg, Florida, we look forward to National Roller Skating Month every year and this October is no different! Skating is our favorite activity and there are a ton of reasons why. So, this year we figured we’d share a little bit about the fun of skating with you. Check it out and come share the fun with us this October! It has been over 200 years since the first person attached wheels to a pair of boots and started skating. Certainly, a lot has changed since then, but the essence has remained. It’s an essence that can be summed up in one word: FUN! Fun is the reason skating has endured all these years as one of the world’s great pastimes! And fun is the reason skating will continue to be a cherished activity no matter how many screens, video games, computers, and devices come into our lives. From a leisurely day with your family to a full birthday bash, skating is affordable, inclusive, and a great time all around! The tangibles are unique and irreplaceable, lacing up your skates and feeling the wind tussle your hair as you push off from the wall and glide effortlessly out onto the hardwood. The feeling you get as you pick up speed and whip through turns is nothing short of pure freedom. Some of our best memories involve watching toddlers holding their parent’s hand and smiling ear to ear as they roll onto the rink for the first time. The joy is contagious here at Skate World. Young and old, boy and girl, everyone has fun with us. So, when you’re thinking up fun fall activities for the whole family, don’t forget that October is National Roller Skating Month! 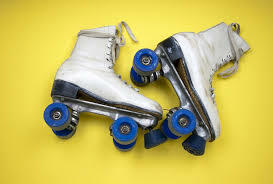 Roll on over, lace up your boots, and do a few laps at Skate World!